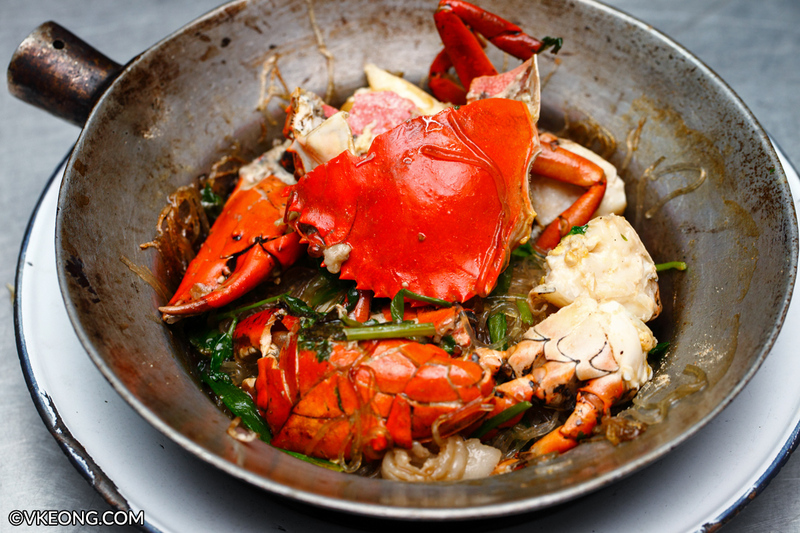 Baked Crab with Glass Noodle (pu ob woon sen) is commonly available in Bangkok‘s seafood restaurants. But there are not many food stalls that specialize in this dish alone. 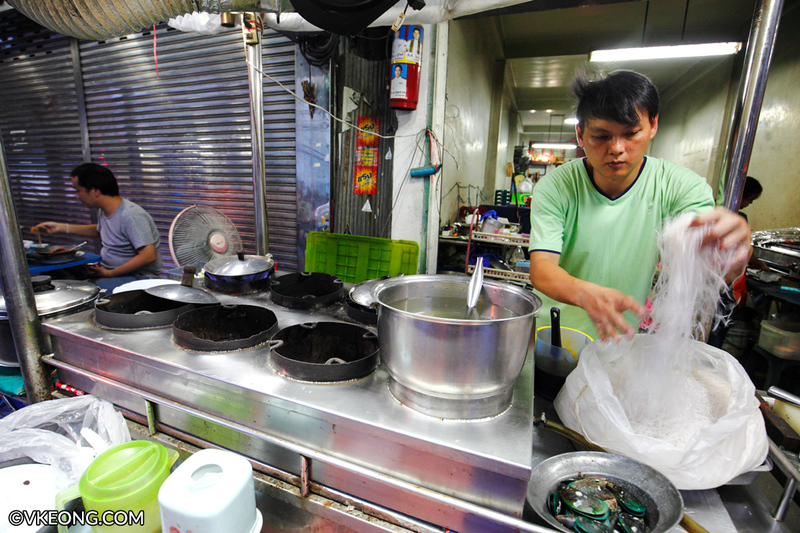 Khlong San is probably the best place to try this, as two popular stalls are located on the same street. Since Somsak Pu Ob (the famous one, also our main choice) was not open, we had to change our plan to eat at Che Peak (Jay Piek) instead. Luckily it’s only a short walk away, like less than a minute. 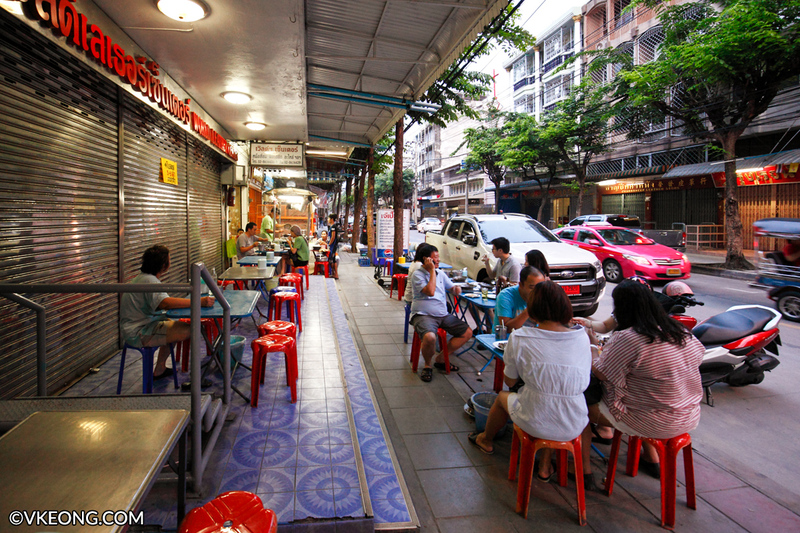 Che Peak might not enjoy the same customer flow as Somsak Pu Ob, but they are more frequented by locals than tourists. It’s a typical street stall where a dozen of tables are set up along the five foot way in front of the leather goods shops after they have closed. Prices are clearly displayed on a mobile signboard but there’s no English translation available. But fret not because the owners are able to speak simple English and they will tell you what they have to offer. 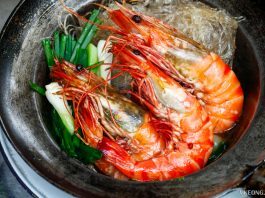 Two of the most popular seafood here are crab and prawn, while other options include mussel and cockle. 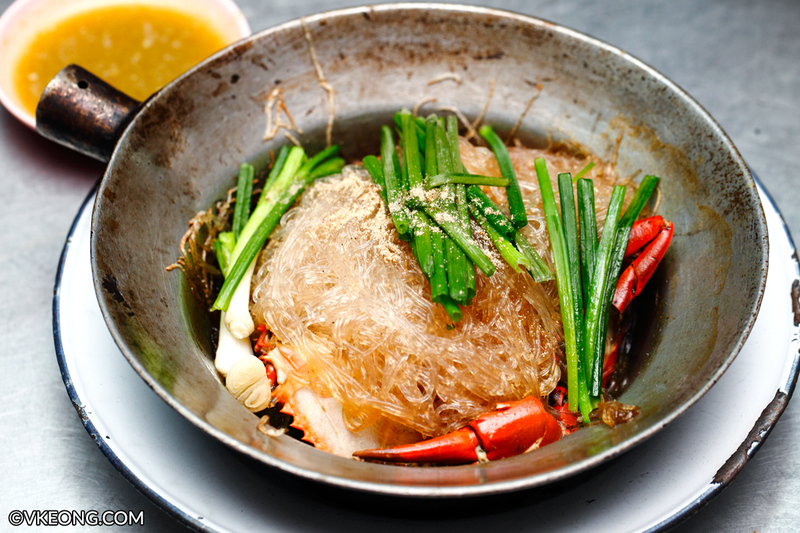 To prepare the woon sen, the pot is first layered with fatty pork slices (acts like lard), followed by ginger, seafood, glass noodle and loads of spring onions. It takes them about 10-15 minutes to cook an order from scratch. 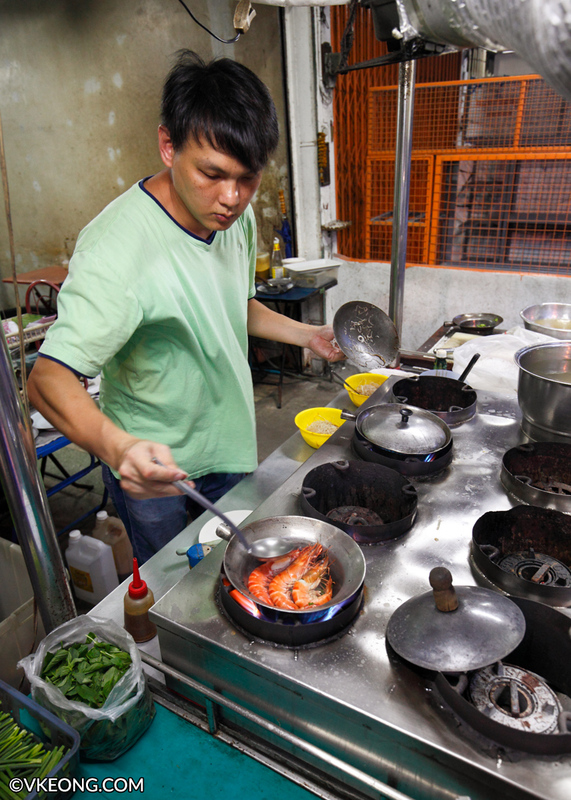 By the time it’s ready, the glass noodle would have absorbed the pork’s melted fat and the seafood’s essence. 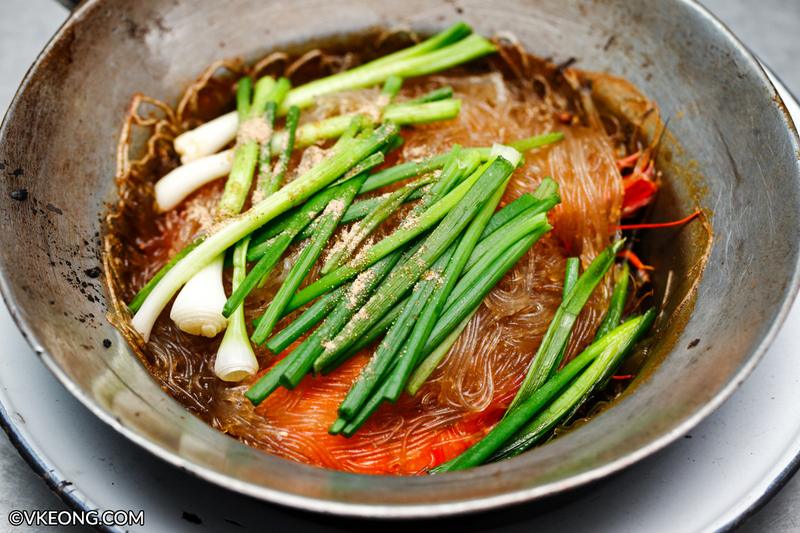 Seasoning is kept to a minimum and they only use a secret blend of soy sauce and a pinch of peppercorns for extra flavor. 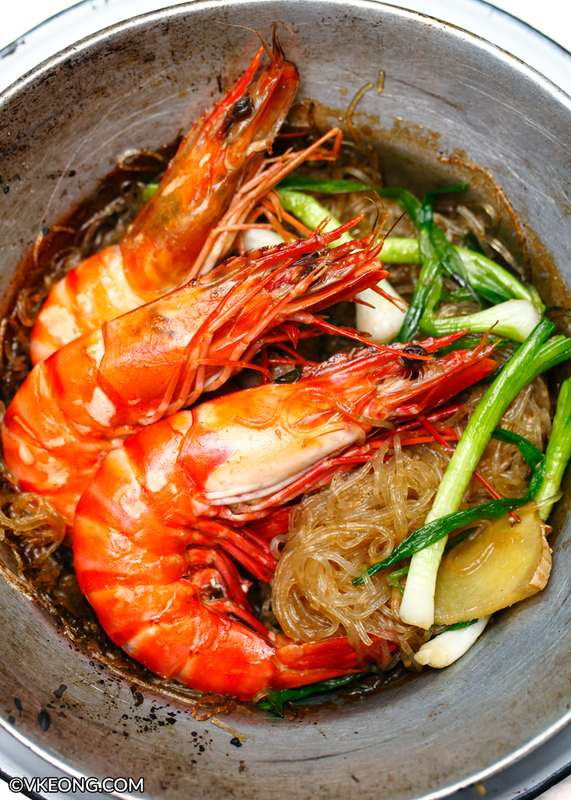 Shown above are the baked glass noodle with crab @ THB280 (~RM33) and with prawn @ THB220 (~RM26). You can’t really see the seafood underneath so let’s dig in to reveal them. 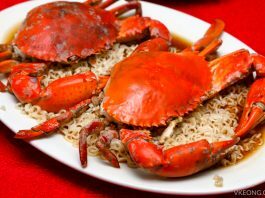 There isn’t much difference in how they overall flavor, except that the noodle in the crab version is slightly sweeter. In fact, it might taste a bit bland to us Malaysians since we are known to have strong taste buds. Well, that’s where the savory and spicy dipping sauce comes in. A small dip of it goes a long way and will improve the experience instantly. 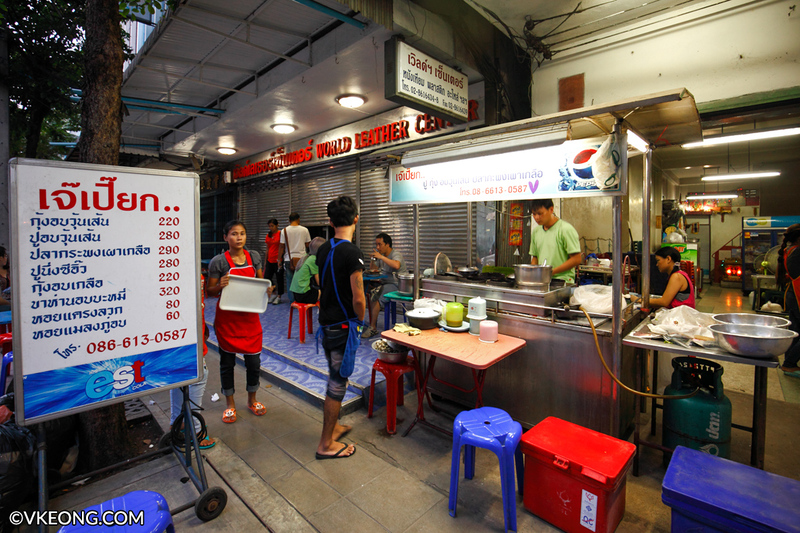 Although this is considered street food, the price is not street at all because of the quality of ingredients used. The crab itself is about 600gm while the prawns were jumbo sized and tasted extremely fresh. If you could only pick one, I’d say go for the prawn version mainly because crab is messier to enjoy. 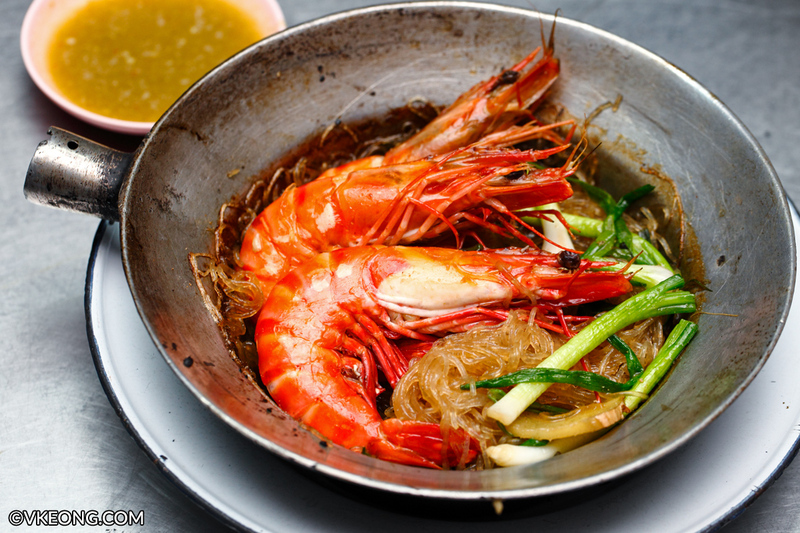 For those who want to enjoy baked seafood with glass noodle without going to Bangkok, Senthai in Kepong serves a similar rendition; albeit with tweaks. Still, it’s delicious as hell.